Situated in the garden on a terrace high above the Villa in a row of three pagodas overlooking the valley, and pine clad hills.3 sides of the pagoda are nestled into the cut away hillside. North East Facing. It has its own electricity. Underneath are lockable draws for luggage. Fairy lights illuminate the interior, window shutters on two sides, and one plug socket. Two single beds and can be made into a double. The wifi only works in the Villa, on the terrace and in Pagoda 2 and 3. 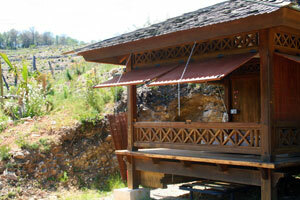 Drop down lockable shutters block the sunlight and give extra privacy in all pagodas . 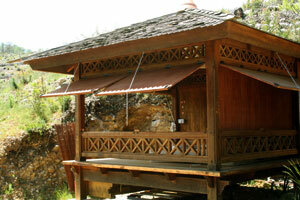 One hot water outdoor shower and one cold outdoor shower two sinks and a toilet service the entire pagoda garden. Towels are not supplied but can be ordered at when booking at check out. We suggest that you bring one pair of walking shoes / trainers for walking along the paths but not necessaray for Pagoda 2 or 3. Pathways are partially lit by solar lights , please bring a torch. There are two lockable draws underneath each pagoda , we hire out padlocks for free but ask for a deposit. 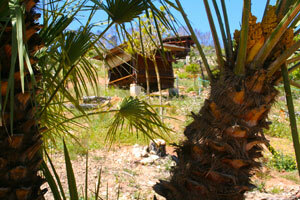 The villa is only available for tea/coffee making and internet during the hours of 8am to 10pm. 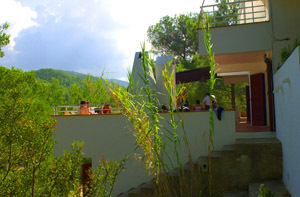 All meals are served on the terrace of Villa Roca. 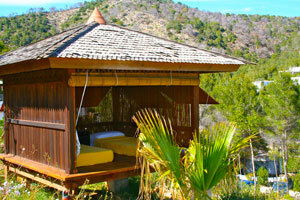 If you are traveling alone and we do not find you a 'pagoda room-mate' you will have the pagoda to yourself. Beds are made with fresh bed linen and pagodas are cleaned on Saturdays only leaving week-day bed making for the guests to do. Only the outdoor shower block and communal area are cleaned each day. 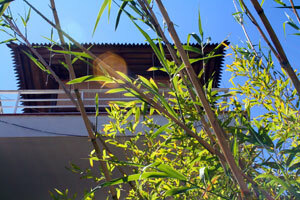 The pagodas are usually our first accommodation to get booked up all season long, reserve early to avoid disappointment. £485.00 GBP per person, sharing. 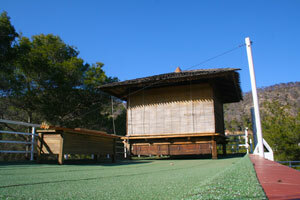 Situated on the roof of the villa above Room 4, close to the yoga space with views over the garden and valley . Wooden window shutters , single beds, interior is surrounded with fairy light and there is one electrical point. 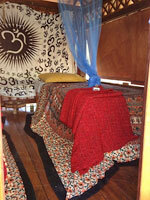 Many of the therapies such as massage that are offered at the retreat take place on the yoga space outside of yoga class hours. This space is next to Pagoda 2. The wall of the pagoda that faces East is solid wood . The 2 sides with wooden shutter windows look towards North West and North. This pagoda and Number 3 are the only pagodas to recieve wi-fi . The wifi only works in the Villa, on the terrace and in Pagoda 2 and 3. 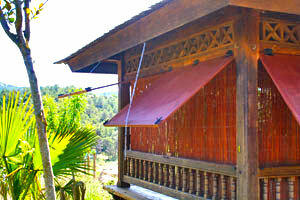 Drop down lockable shutters block the sunlight and give extra privacy in all pagodas . 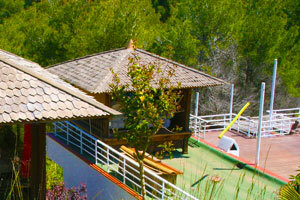 One hot water outdoor shower and one cold outdoor shower two sinks and a toilet service the entire pagoda garden. Towels are not supplied but can be ordered at when booking at check out. We suggest that you bring one pair of walking shoes / trainers for walking along the paths but not necessaray for Pagoda 2 or 3. Pathways are partially lit by solar lights , please bring a torch. There are two lockable draws underneath each pagoda , we hire out padlocks for free but ask for deposit. 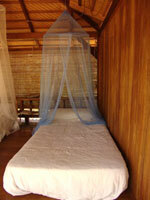 The villa is only available for tea/coffee making and internet during the hours of 8am to 10pm. All meals are served on the terrace of Villa Roca. 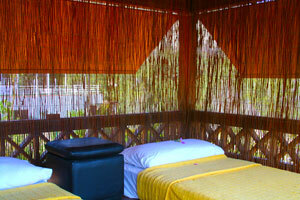 If you are travelling alone and we do not find you a 'pagoda room-mate' you will have the pagoda to yourself. Beds are made with fresh bed linen and pagodas are cleaned on Saturdays only leaving week-day bed making for the guests to do. Only the outdoor shower block and communal area is cleaned each day. 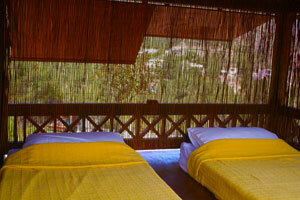 The pagodas are usually our first accommodation to get booked up all season long , reserve early to avoid dissappointment. Closest pagoda to the villa positioned on a terrace in the garden. 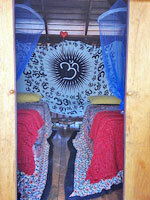 It is close to Room 4 and the stairs that lead to the yoga space. Large underfloor lockable storage draws. Sleeps two with views of the garden. 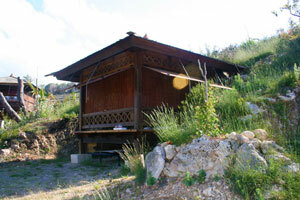 Use of outdoor shower facilities & toilets. Pagoda Guests are only allowed to use the Kitchen & Living Room inside Villa Roca, all other rooms and facilities are for Villa Roca guests only. You can receive wifi from this pagoda and there is a power point. The wooden shutter window doors open up and face North. The back of the pagoda is nestled into the cutaway hillside that has been brick walled. The price of your holiday includes 18 hours of yoga and 1/2 board food. 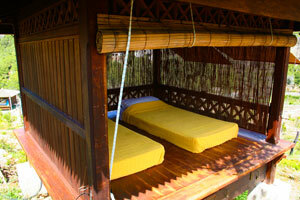 All pagodas are two-share but possible to have alone for a higher price bookable at web check out. 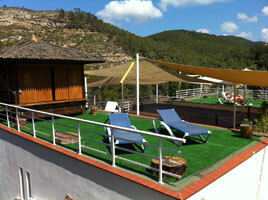 The wifi only works in the Villa, on the terrace and in Pagoda 2 and 3. 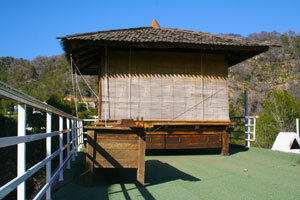 Drop down lockable shutters block the sunlight and give extra privacy in all pagodas. 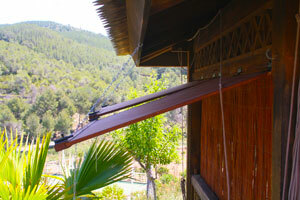 One hot water outdoor shower and one cold outdoor shower two sinks and a toilet service the entire pagoda garden. Towels are not supplied but can be ordered at when booking at check out. We suggest that you bring one pair of walking shoes/trainers for walking along the paths but not necessary for Pagoda 2 or 3. Pathways are partially lit by solar lights, please bring a torch. There are two lockable draws underneath each pagoda, we hire out padlocks for free but ask for a deposit. 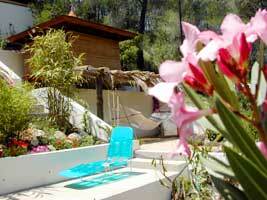 The villa is only available for tea/coffee making and internet during the hours of 8 am to 10 pm. All meals are served on the terrace of Villa Roca. 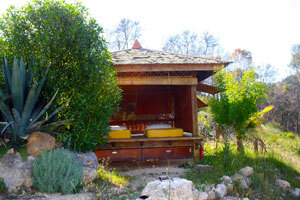 If you are traveling alone and we do not find you a 'pagoda room-mate' you will have the pagoda to yourself. Beds are made with fresh bed linen and pagodas are cleaned on Saturdays only leaving week-day bed making for the guests to do. Only the outdoor shower block and communal area are cleaned each day. The pagodas are usually our first accommodation to get booked up all season long, reserve early to avoid disappointment. 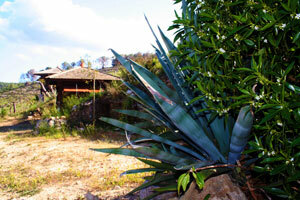 East Facing Situated on the highest terrace overlooking the villa, pagodas and garden. 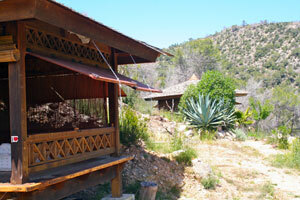 Tucked behind a large bush and nestled into the side of the mountain with Northerly valley views from 2 sides. This is usually the first pagoda to get booked and has already been booked for many of the weeks of 2017. It has its own little garden, with a few plants and a small tree. Has the most private positiion. Fairy lights illuminate the interior, drop down blinds & lockable shutters for total privacy, one plug socket. There are many steps up to this pagoda , it has a very good position and has a secluded element , year after year guests return to stay here . Situated to the far right of the garden in a row of three pagodas being number 1 to its left and number 5 further along and higher to the left. The price of your holiday includes 18 hours of yoga and 1/2 board food . 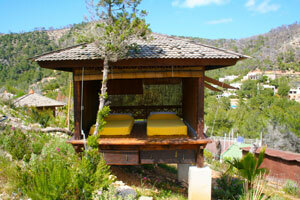 All pagodas are two-share but possible to to have alone for a higher price bookable at web check out. 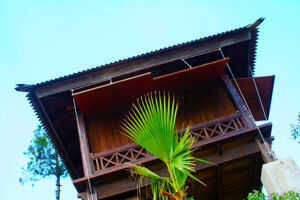 Situated in the highest position of all the pagodas built on large concrete stilts. The best views are to be had from this pagoda and it is the favourite of many returning guests but is the furthest from the villa. This pagoda and number 4 are the most rebooked pagodas but returning guests. 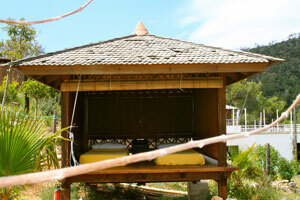 The Queen Pagoda has two single beds. One electrical point. Fairy lights illuminating interior. Large lockable storage draws under pagoda floor. 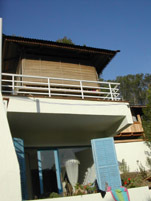 Built on the same level as the villa facing North East. Pagoda 6 is 15 meters from Villa Roca. Sliding panelled doors to the front & lockable shutters to 2 sides this allowing the cool night air flow through. single beds and one electrical point. There are large lockable storage draws under the pagoda floor. 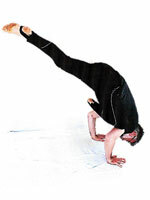 Situated closest to the driveway , a 30 second walk to the yoga deck and close to the shower block. The wifi only works in the Villa, on the terrace and in Pagoda 2 and 3.Drop down lockable shutters block the sunlight and give extra privacy. 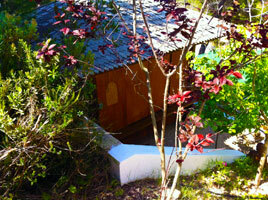 One hot water outdoor shower, two sinks and a toilet service the pagoda garden.Towels are not supplied. Bring one pair of walking shoes / trainers for walking along the paths not necessaray for Pagoda 2 or 3. Pathways are partially lit by solar lights , please bring a torch. The villa is only available for tea/coffee making and internet during the hours of 8am to 10pm.All meals are served on the terrace of Villa Roca. 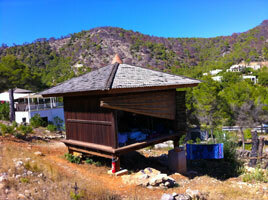 If you are travelling alone and we do not find you a 'pagoda room-mate' you will have the pagoda to yourself. Beds are made with fresh bed linen and pagodas are cleaned on Saturdays only leaving week-day bed making for the guests to do. Only the outdoor shower block and communal area is cleaned each day. £495.00 GBP per person, sharing. This will become available in high season , if you wish to book it prior to that please email us for further details . 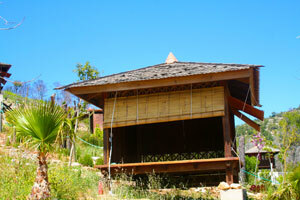 This hut is next to the villa , shares the pagoda garden , has Wifi (not brilliant connection but some) . Very popular . Price wise it will be a little more expensive than the pagodas around 10% higher. Do not book it via our site please thanks.